Maarten and I visited the Posbank, to see the heath blossom. We had a nice walk trough the woods and the heath and visited a couple viewpoints by car. At the beginning of the month I started 'Veranderende Grenzen 1: Nationalisme in Europa (1815-1919)' (Changing Borders 1: Nationalism in Europe (1815-1919)). I'm allowing my self 5 weeks for 4,3 ECTS, should be doable! Roeland and I visited Warmond by bike. we walked around the park surrounding Huys Oud Warmont and had drinks before heading back to Leiden. I'm pretty sure it has been years since I rode my bike that far. I was pretty exhausted afterwards, but I made it there and back to Leiden again! (I got my bike from Zoetermeer to Leiden by train.) I won't be attempting longer distances, but, providing good weather, I might try this kind of distance again. Martijn and Jill came over for a late birthday visit for Maarten. I worked at Museum Meermanno during Museum Night in The Hague. There was a military theme, fitting the exhibition on military books. I started by trying to sell food coupons for soup, bread and butter. Pretty much in vain, since people just had dinner. Later I stood at the door, welcoming people and bidding them goodbye. 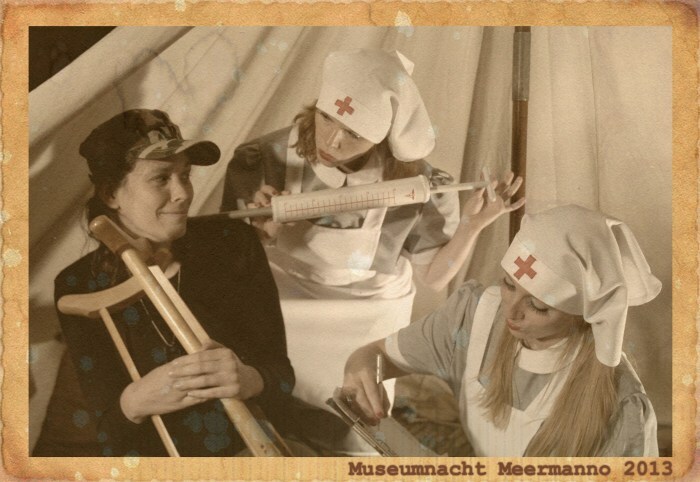 There we're all sorts of fun activities, like decorating a dog tag, marching along with a weird general, listening to a lecture of Kees van Kooten and getting fake wounds and having your photo taken with a couple of nurses... A DJ and a band took care of the music. During the monthly filmnight a bunch of friends and I went to dinner at 'Leuk eten en drinken' in The Hague. Nice food and service, okay balance between prices and quality, but noisewise, not so good; there were six of us and yet it was hard to keep te conversation central because we couldn't hear each other properly. Potatoe soup (that I had been craving during the day, so I was very happy that they had it on that day's menu!) and goat cheese loempias. After dinner we went to see the movie Elysium. Oh, so bad!!! During open monument weekend Roeland and I went to see the 'Rijksmuseum voor natuurlijke historie', A house on Rapenburg, the Pieterskerk and the Sterrenwacht in Leiden. Collection database and newsletters @ Meermanno. Slowly getting the hang of writing job applications. Crossing my fingers for my latest one, I would be happy with anything that fits my abilities but I so hope to be able to find a job in a museum! Making travel plans with Maarten. Oh, yeah!!! Going to make an old dream come trough. After a birthday visit to Nicolette I travelled to Kuinre, where I spent a fun weekend with a group of 25/30 people, most of which I hadn't met before. I had a good time playng games, getting to know new people, talking, laughing, cooking and going on a geo cache in the woods. We stayed at group accomodation De Waker, which was pretty good. We had soup the first night. I took part in the cooking all weekend, which is the easiest way to work around my food intolerances. I learned to play The Settlers of Catan, this had been on my wishlist of games to play for a while, fun! Indian curries and such the second day. Tiny toads, a baby ringed snake, lots of mushrooms, thorns, hidden clues and choosing the wrong path several times. It was my first geo cache walk, another activity I had heard about but had never experienced before. Fun! J. and I met up for drinks at 'Anne & Max' in Leiden. Smoothies! A new issue of our patient magazine came out. I wrote an article about art journaling and crafted the cover (except for the orange border, not shown here). I attended the yearly get together of my culture studies faculty in Nijmegen. Lectures on a biblical open air museum (Heilig Landstichting/Bijbels Openluchtmuseum/Museumpark Ori�ntalis), on Mind and on what we are left with if God doesn't exists. I especially liked the first two lectures and enjoyed meeting some people I don't often get to see. With Roeland and R. I visited Haagweg 4 and the Meelfabriek during the art route in Leiden. Many artists had opened their studios to the public.